Many of you might be running the Chicago Marathon this year with a simple goal: Qualify for Boston. Many more of you want to know what race pace you might realistically expect to achieve. This article is for both audiences, though it is from the perspective of Boston qualification. There are different ways to qualify for Boston on the same course. I’ve run a Boston qualifying time in my last nine Chicago marathons, but I have yet to run a perfect marathon in Chicago. I have had good qualifying runs and painful qualifying runs. I have not been able to run negative split marathons. I simply have done the best my conditioning and experience allowed at the time. And that’s what this article will show you — the details behind several of my Chicago marathons, for insight into my approach to qualifying for Boston at the Chicago Marathon. The first time I ran Chicago in an attempt to qualify for Boston was in 1995. I was an inexperienced marathoner with two marathons under my belt: a 4:47 debut in Chicago 1994, and a 3:48 at Lake County in April 2005. I trained diligently to get comfortable running 7:29 miles, the magic pace that would lead to a Boston qualifying time of 3:15. I approached the starting line in 1995 ready to qualify. And I charged out fast right from the start. Bad idea. I ran the first half fast; way too fast. I ran the first 13.1 miles in 1:29:53, and then it all began to fall apart. By mile 15 I had slipped to 7:30 miles, creeping steadily slower until I was barely hanging on to 8 minute pace at mile 21. By mile 24, my watch was telling me a 3:15 qualifying time was within reach, but slipping away fast. I slowed to 8:30/mile pace as the pain intensified and my desire to give up increased. I wished I was not so close to qualifying; it would make slowing down much easier. But I had to keep going, and soon the finish line was in sight. After an excruciating 1:44 second half, I did cross the line with a 3:14:28 finishing time. I had qualified. I returned the next year to run almost exactly the same overall time, but the pacing was far different. More balanced, steadier, in control. 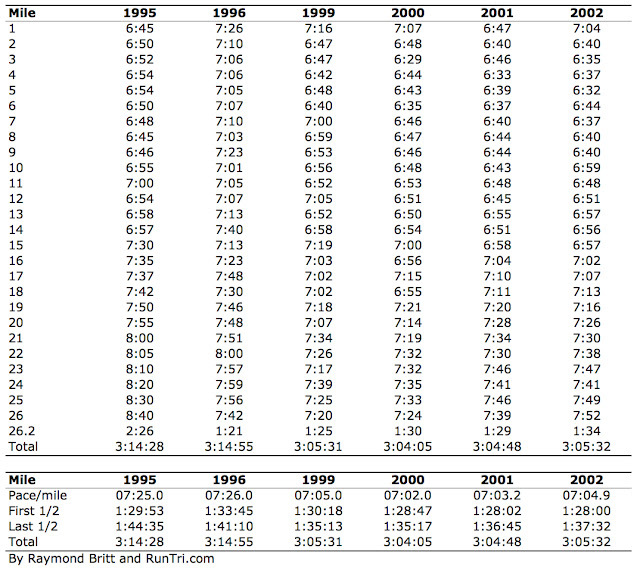 Take a look at the mile-by-mile splits. 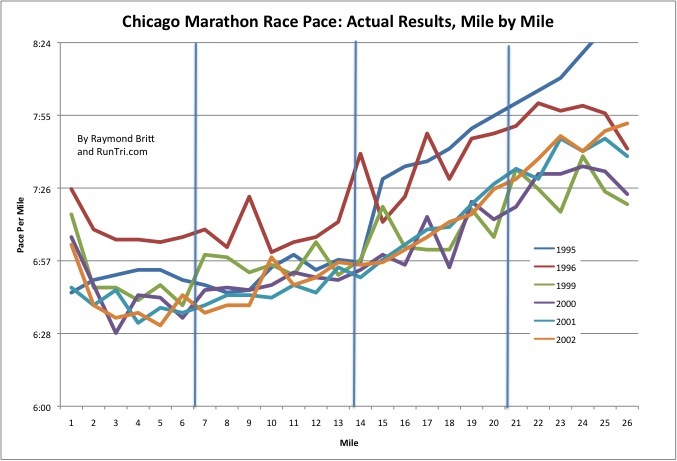 Yes, the pace eased later in the race – as it does each time I run Chicago – but I felt reasonably great when I finished. By the time my qualifying standard increased to 3:20, I was running much faster. 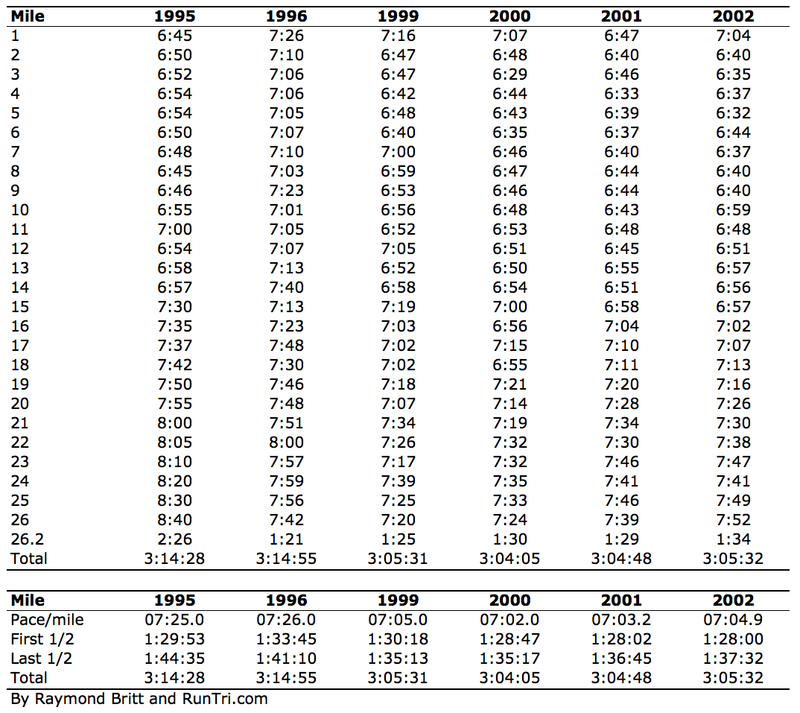 My next breakthrough in Chicago was a 10-minute improvement to 3:05 in 1999. I had been competing in triathlons for a few years, and was a better all around athlete. In 1999 I came my closest to running a perfect marathon in Chicago: 1:30 in the first half; 1:35 in the second half. The next three years, I ran about the same time, with subtle differences, mainly slightly faster first halves and slower finishes. What makes the difference in running Chicago well or poorly, fast or faster? It’s how you handle the course. Yes, Chicago is a comfortable, flat course. Yes, it can be fast. But the downside is that it can be terribly seductive in the first 13 miles. You are with thousands of runners, surrounded by thousands more spectators. There is cheering from within the pack of runners and from both sides of the street. The first miles feel too easy. You are fast; you’ve trained for this. It’s your day. The pace pulls you along, It’s like running 75 mph in a 55 mph zone; it’s ok, but you might get caught. You need to control your own race as soon as you can. Allow things to sort themselves out in the first mile or two, then settle down to the pace you planned to run. You don’t need to let your watch control your race. Run at the pace that feels comfortable. But if you see that you’re 30 seconds faster per mile than you expected, that’s probably not a reason to be excited. It’s a reason for caution. Take it easy. As you head north through the Lincoln Park Zoo toward Fullerton, sometimes the hardest thing is to see people passing you. Let them go. Run your race, and you’ll see them later. When the course makes the turn to head back toward the loop, most runners around you will have settled into a rhythm. You should, too. Continue to run at your planned pace. It’s a good thing to see mile after mile within a few seconds of each other. One of my favorite parts of the race is running through the Loop as the 13.1 mile point approaches. Crowds are thick, I’ll see my family soon, and I’m feeling pretty good. Beware: as soon as you cross the 90/94 bridge on Adams headed west, it all changes. It gets quiet. The pack thins out. You still have half a marathon to go. You might not feel as zippy. This is the time when you need to make a point of holding onto your concentration, holding onto your pace. Slow down in the teen miles – 14 to 19 – and your chances of qualifying can slip toward the danger zone. You tend to not get faster after that. You will be running through the West Loop, out, back, out, back, and suddenly the miles seem longer. Just take it a mile at a time. Don’t let yourself lose focus. Give it that extra effort. Tell yourself at this point it can hurt more to run slow than to run fast. Keep going. The stretch between the dancing dragon in Chinatown and White Sox park is sort of no-man’s land. Still not close enough to the finish, but far enough from the start to have been running hard for more than two hours. Put your head down and focus only on getting to White Sox Park. When you get there, you will have broken through the mythical wall, and will be on your way home. After Sox park, you turn left over the Kennedy, then left again to face the Sears Tower. In a way, you can see the finish line, just a few miles ahead. You’re getting there. If it’s close, the difference between qualifying for Boston or not will become clear in the last 4 miles. If you have run smart, you will be exhausted, but in control enough to hold onto your pace. You will have the strength to reach the mile 24 marker, and if your watch tells you to speed up, you’ll be able to do so. That’s what you ultimately want. Strength to go fast in the final two miles. That may make the difference. Run fast. Run with purpose. Run with a smile as you cross the line. Run your way to a qualifying time.